When I asked for twice baked potatoes theme suggestions my 11 year old nephew said, “blimp”. So I made this blimp themed lunch for him. This is my pistachio loving nephew so of course I had to include his favorite nut. This entry was posted in Bento / Cute Food, Food and tagged bento, lunch, twice baked potato, vegetarian. Bookmark the permalink. Only Silas!!! Very fun – the blimp is great and the blue sky too! And he is a nut! The best kind! 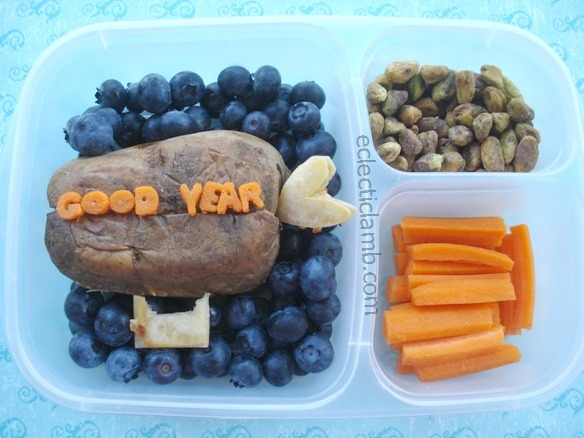 I love this cute blimp bento, so creative with the potato! This is stunning! Got that Studio Ghibli vibe! 🙂 Love it! Excellent idea for a blimp!